Lynn Koolish is a fiber artist, teacher, and author. 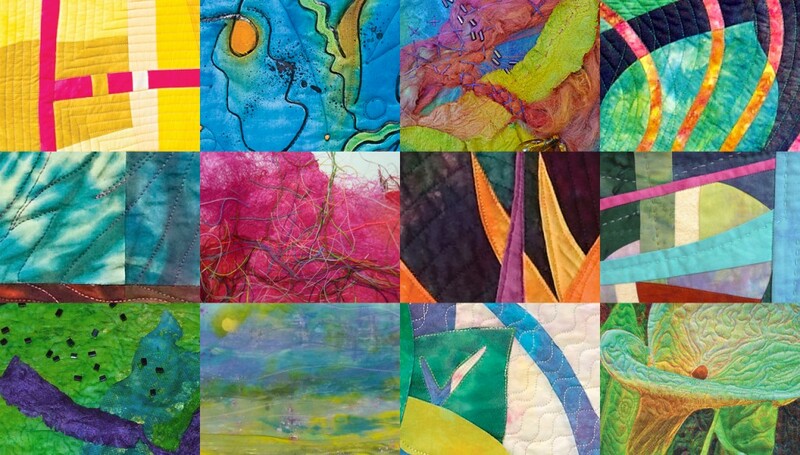 She makes art quilts using her brightly-colored hand-dyed fabric. Lynn also creates mixed-media fiber art. She has been making quilts for over 30 years. She loves sharing her knowledge and techniques with others through her teaching. As a fiber artist, Lynn also uses photo-editing techniques to create digitally printed quilts. Lynn is a Bay Area Fabric Artist and Teacher specializing in art quilts and fabric hand-dyeing and painting. Lynn Koolish teaches locally in the San Francisco Bay Area. She also teaches nationally at venues including International Quilt Festival in Houston and Quilters Affair in Sisters, Oregon. To take a class from Lynn Koolish, look at the Workshops page. Machine-stitched Fiber Collage and Paint & Make a Mixed-Media Fiber CollageSurface Design classes include fabric dyeing and fabric painting using a variety of techniques.Piecing classes include free-form piecing and improvisational piecing. Fast, Fun & Easy Fabric Dyeing. The Wonderful Colorful Wonder Wheel of Color (with Kerry Graham and Mary Wruck). Innovative Fabric Imagery for Quilts (with Cyndy Rymer). More Photo Fun (with the Hewlett-Packard Company and Cyndy Rymer). She also has a DVD, Lynn Koolish Teaches You Printing on Fabric. The books and DVD are available at C&T Publishing.